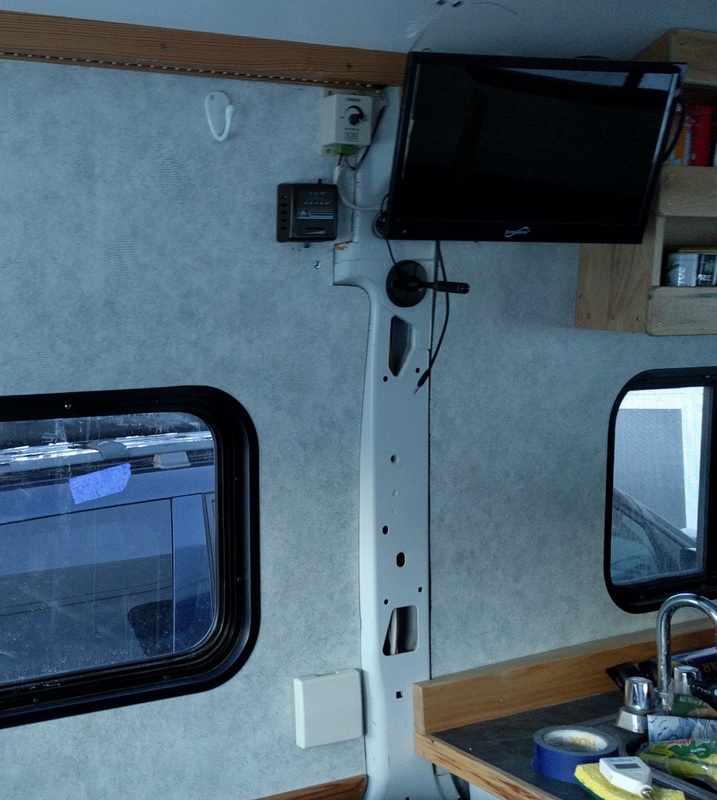 There has been an interesting discussion going on on the ProMaster Forum on insulating camper vans and particularly the effect of the metal frames as thermal bridges and how much these bridges reduce the effectiveness of insulation. There has been some concern that the heat losses due to thermal bridging may be so large as to make it not worthwhile to insulate. 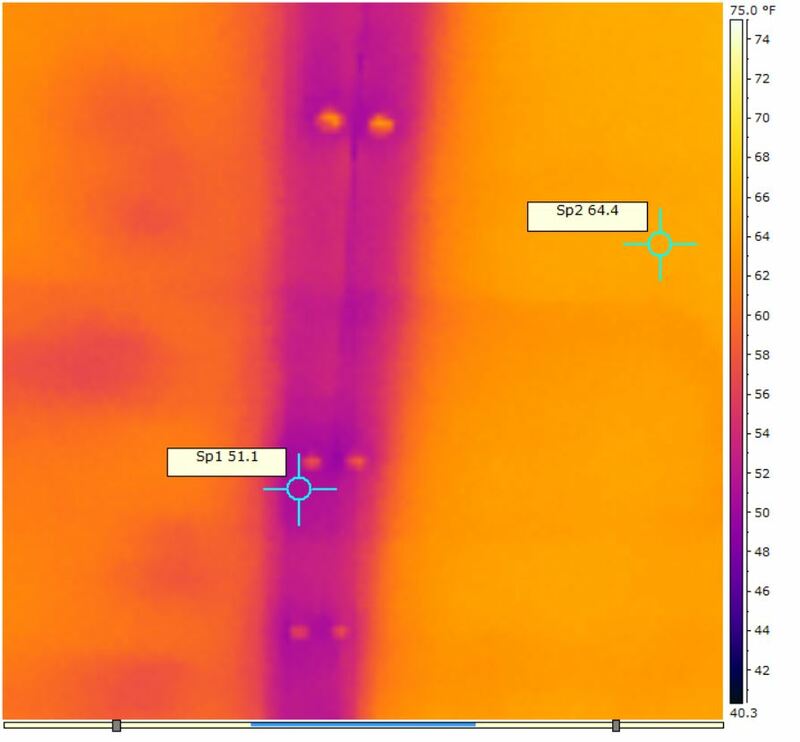 I took some pictures with my thermal (IR) camera which (I think) give some idea of the relative importance of thermal bridging losses to heat loss through the large insulated areas. The van inside temperature of the van was about 70F (varying from 68F to 74F depending on location). The outside temperature was 23F. No sun on the outer surface of the van. 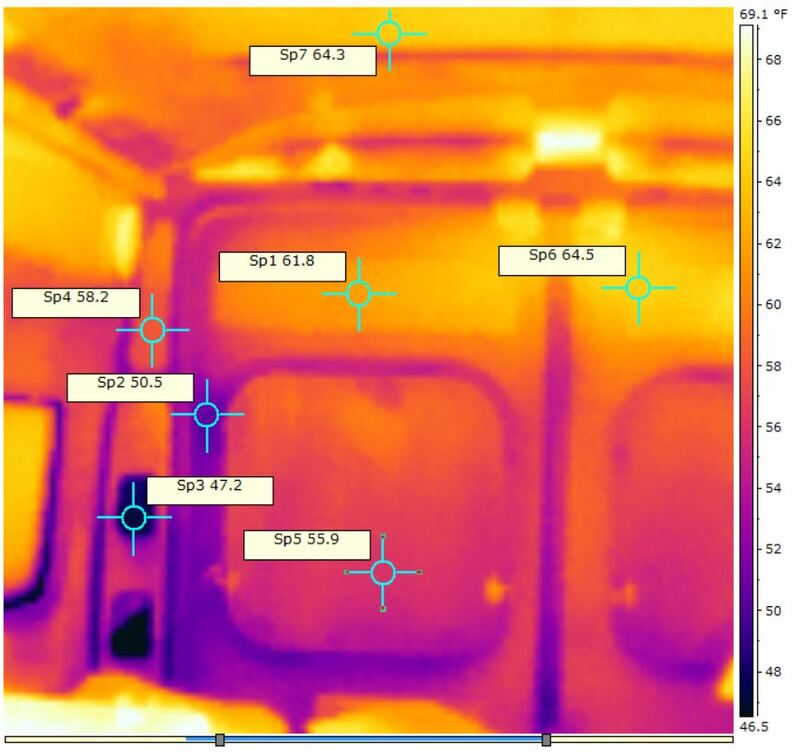 This thermal picture shows the drivers side wall of my van, and includes the large metal vertical frame that is about 4 ft behind the drivers seat. The metal frame has no paneling over it, and no insulation inside of it as its where I ran a lot of wires. The area forward and aft of the metal frame is 1/4 inch paneling with roughly one inch thick urethane spray foam insulating it. 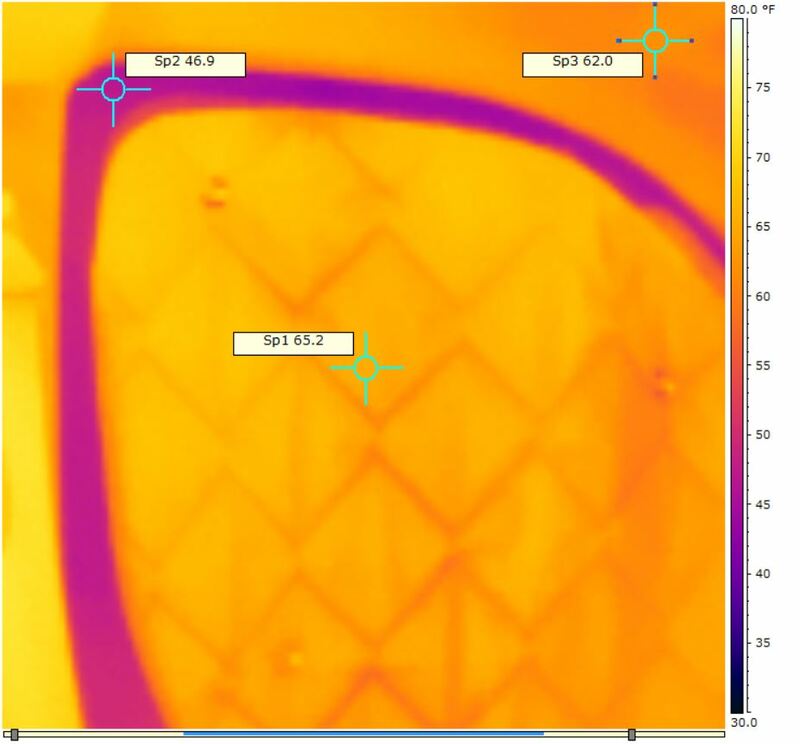 There is also a window in the picture to see how it compares in heat loss to the metal frame. The heat loss from the inside air at 70F and the wall surface is directly proportional to the temperature difference between the wall and the inside air. So, wall areas that show up as cold are losing more heat than wall areas that show up warm. A wall area that is (say) 20F lower than the air temperature is losing roughly twice as much heat as an area that is 10F below the air temperature. The colors and the labels show the surface temperature of the wall. So, 65F for the insulated wall panels, 58.2F for the inside surface of the bare metal frame, and 52.5F for the window surface. The frame is obviously not a perfect thermal bridge to the outside because if it were, its inside surface temperature would be 23F (the outside temperature). Instead it is 58.2F, which is actually much closer to the inside air temperature than the outside temperature. The temperature of the window glass is 52.5F, so it is more of a “thermal bridge” than the metal frame. In other words, the uninsulated window losses more heat per sq inch of area than the metal frame does. The heat loss from the inside air (70F) to the wall surface is directly proportional to the difference in temperature between the inside air and the wall surface. So, for the insulated paneling, the difference is (70F – 65F) = 5F, and for the metal frame it is (70F – 58.2F) = 11.8F. So, each sq inch of the metal frame loses (11.8F/5F) = 2.4 times as much heat as a sq inch of insulated wall panel. But, there is not all that much metal frame area, so even though its losing more heat per sq inch, there are not that many sq inches. This IR picture is of the ceiling, which is paneled with 1/8 inch hardboard. 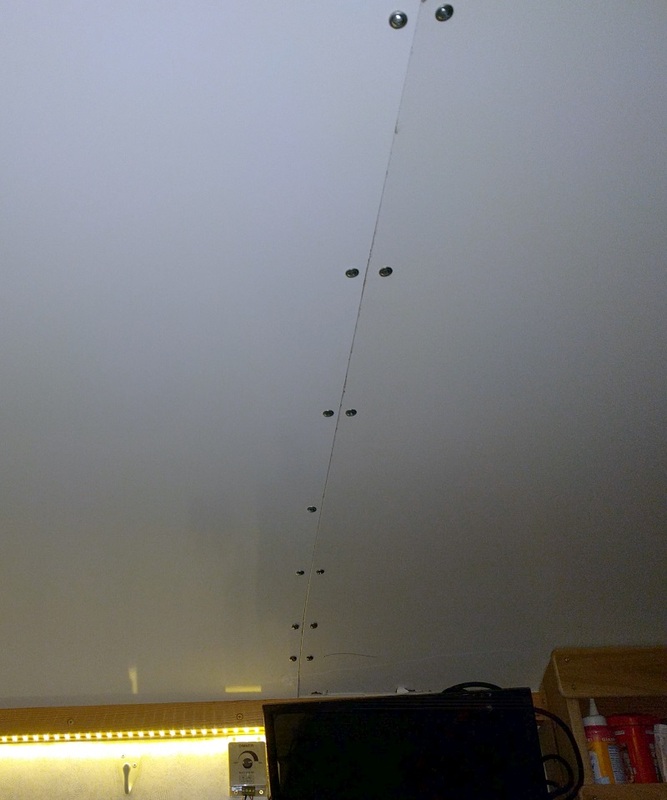 The hardboard sheets are screwed directly to the metal ceiling ribs, which are about 3/4 inch deep. 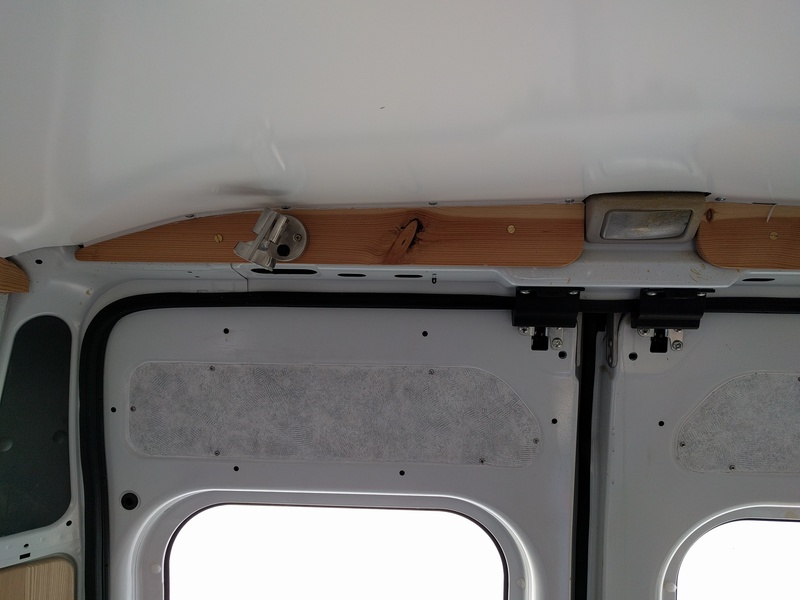 With the ceiling panels screwed directly to the ceiling ribs, this is a direct thermal bridge from the outside van skin to the paneling. The ceiling between the ribs is insulated with 3/4 inch of spray urethane foam. Regular picture of ceiling at a rib. So, the ceiling paneling temperature in the ceiling rib thermal bridge area is 51.1F, and the temperature away from the thermal bridge is 64.4F. So, the ceiling ribs are a little more effective as thermal bridges than the side wall frames — maybe due to the lesser depth of the ribs than the frames. The heat loss from the inside air to the paneling is directly proportional to the difference in temperature between the inside air and the paneling. This is (70F – 64.4F) = 5.6F for the insulated panel area, and (70F – 51.1F) = 18.9F for the area directly over the rib. So, the heat loss per unit area for the rib area is (18.9/5.6) = 3.4 times greater. But, even though the ribs lose 3.4 times as much heat for each sq inch as the insulated paneling, the total rib area is only about 10 % of the ceiling area. If you go through the math, the ceiling heat loss with the thermal bridges at the ribs is about 24% greater than it would be without the rib thermal bridges. If you left out the ceiling insulation altogether, the ceiling heat loss would be increased by about 700% — so the idea that thermal bridges are so damaging that it does not make sense to use any insulation is not even remotely true. This rib thermal bridge heat loss could easily be eliminated by just furring down from the ribs using 3/4 inch lumber, and then attaching the ceiling to the furring strips (as many people have done). Just be sure to fill the 3/4 inch between the paneling and the ribs with insulation. If I were doing my ceiling again, this is the way I would do it — in addition to reducing heat loss, it would likely make it easier to install the ceiling panels. Single glazed windows are essentially thermal bridges, so this part looks at heat loss through windows without insulation and with a small amount of insulation in order to get some idea what effect putting a small amount of insulation in series with a thermal break does to reduce the heat loss. Quite a lot as it turns out. 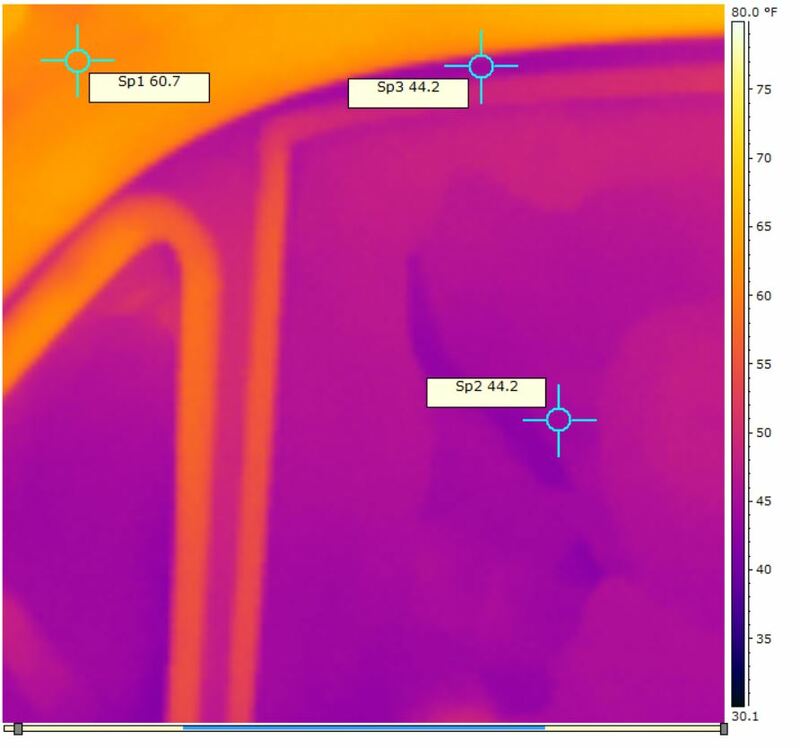 Thermal images of an insulated window and a non-insulated window are compared below. The inside temperature of the glass surface is 44.2F (21.2F above the outside air temp), and the metal door frame is also at 44.2F. The inside temperature of the headliner is 60.7F. 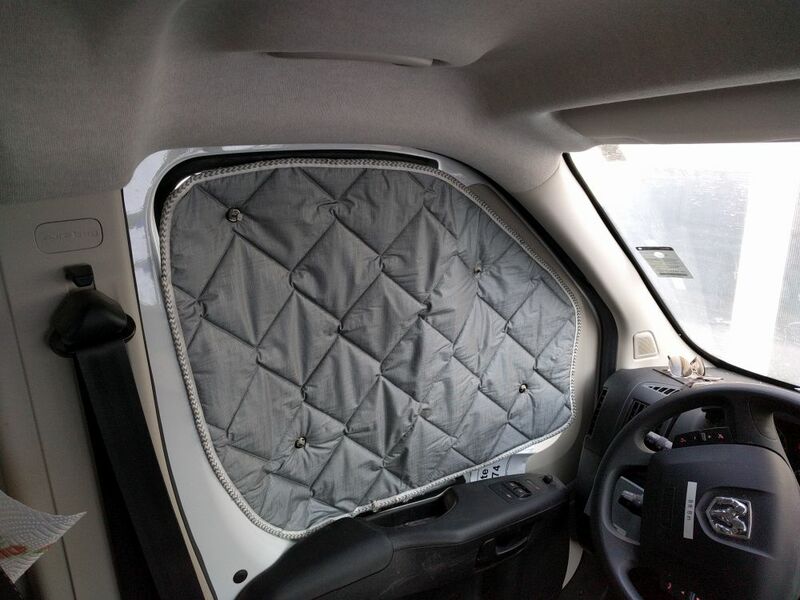 This is a picture of the window on the driver side of the van with its insulation panel installed. 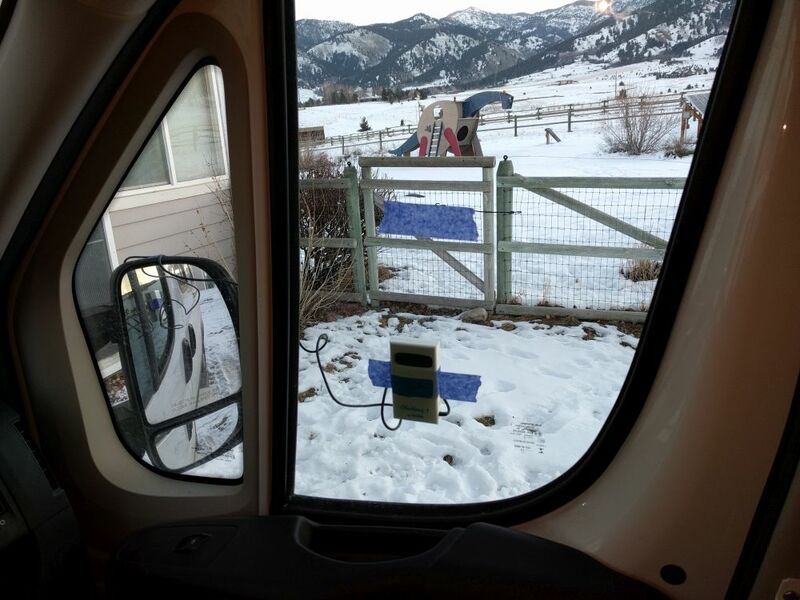 The insulation panel is only a bit over 1/4 inch thick (similar to a layer of Reflectex), but its insulating value value raises the inside surface air temperature from 44F for the bare glass to 65F for the insulated window. Point is that placing a small thickness of insulation in series with a thermal bridge will dramatically reduce heat loss through the bridge. IR picture of the back door area. The back door is insulated as best I could, but with the mechanisms and the small spaces around the window its hard to insulate well. The average temperature of the whole back door wall is kind of low. Thermal bridges do increase heat loss, but (I think) not nearly as much as some have suggested. Maybe something like 25%. For a lot of people that camp mostly in moderate temperatures, it does seem (to me) that its not worth going through a lot of trouble to cut the thermal bridging losses through the metal frames as they are not a huge source of heat loss — just insulating the large areas between the frames is probably fine. But, if you camp a lot in cold weather where cutting heat loss is really important, you could insulate over the metal frames with something like half inch polyiso with the paneling over that — I think this would reduce the thermal bridging effect of the metal frame significantly. But, maybe I’m missing something? If so, please leave a comment below. 1. Is there an insulating product that could stick to the exposed parts of the frame that could increase R-value and thermal conduction – like rubber? 2. On the ribs, could a product like thinsulate/or some thin insulator be wrapped and then tucked/secured underneath the insulation panels? Prior to panels being to secured to walls/ceiling? I used foundation sill seal foam for some of the testing. It comes in rolls and is about 1/4 inch thick and made from polyethylene foam. I think this could be glued in place with something like 3M-90 and would probably help. Once the paneling was up, it would also hold the foam in place. Something like half inch polyiso would be more effective and is probably flexible enough to conform to the shape of the frames. Most people foam their wall insulation panels with Great Stuff right to the edges, so not sure about tucking the Thinsulate under it. Wow, great job Gary. 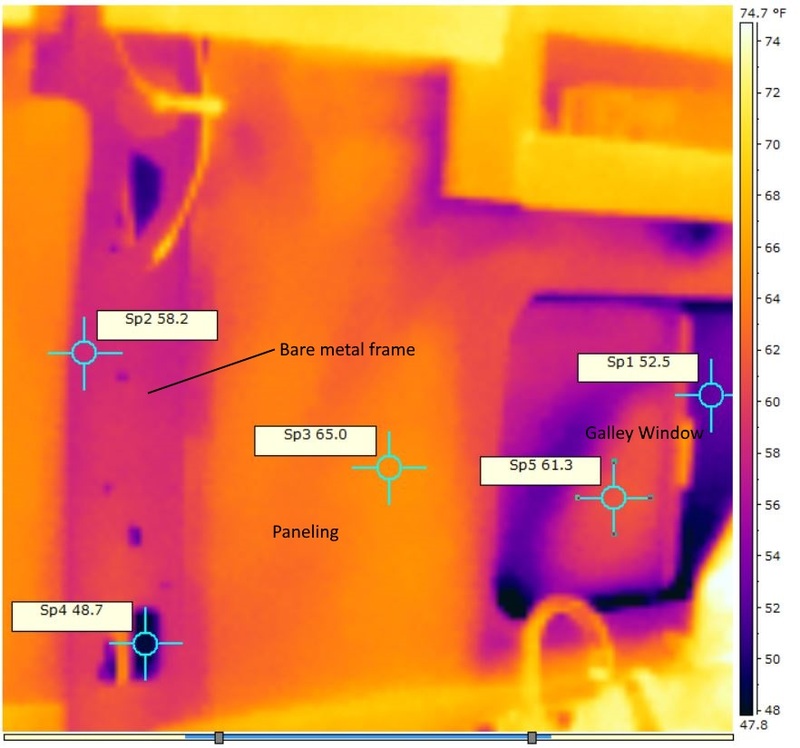 I wouldn’t know enough to vet your mathematical evaluations of this, but just the fact that you put the effort into attempting to measure and quantify thermal bridging is awesome. Lots of people mention it, but you’re the first I’ve seen try to find some concrete evidence. I agree that the truth probably lies somewhere in the middle between the two camps. At the end of the day, we should mainly focus on the biggest heat loss areas and just do our best to insulate thermal bridges. Thanks for the confidence! This is awesome information! Thank you!